Cam Talbot had every reason to celebrate as the buzzer sounded and the Edmonton Oilers secured their first win of the season. 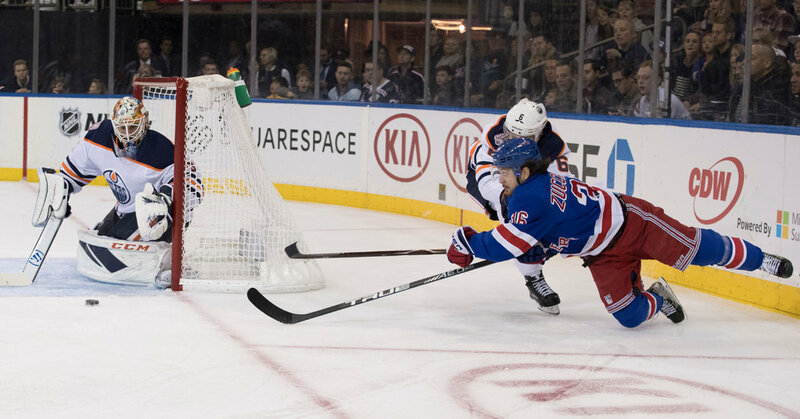 Talbot stopped 23 shots against his former team and Connor McDavid had a goal and an assist to lead the Oilers past the Rangers, 2-1, on Saturday afternoon at Madison Square Garden. It was also Talbot’s first win over the Rangers, the team he helped reach the Stanley Cup finals in 2014 as a backup to Henrik Lundqvist. Talbot was all smiles as the Oilers prepared to fly home after a two-week trip that included their season opener in Sweden. McDavid scored his second goal of the season at 6 minutes 23 seconds of the third period, redirecting the puck past Lundqvist on the power play with Rangers forward Vladislav Namestnikov in the penalty box for holding. Leon Draisaitl and Ryan Nugent-Hopkins had assists. The Oilers lost their season opener, 5-2, against the New Jersey Devils in Sweden before dropping their next game, 4-1, on Thursday at Boston. McDavid, 21, who has led the N.H.L. in points in each of the past two seasons, has points on all five Oilers goals in three games this season. The first overall selection in the 2015 draft, he is one of 11 first-round picks on the roster. Mika Zibanejad opened the scoring for the Rangers with 7:11 to go in the first period. The fleet Zibanejad took a pass from defenseman Marc Staal and put the puck past Talbot. Defenseman Brendan Smith also assisted on the goal, Zibanejad’s first of the season. Zibanejad also twice rang shots off posts behind Talbot, who also denied him in the waning seconds. Nugent-Hopkins tied the score, 1-1, with 5:43 left, tapping a rebound past Lundqvist for his first goal of the season. Defenseman Darnell Nurse — playing his 200th N.H.L. game — and McDavid assisted. The Rangers came out with purpose for the matinee against the previously winless Oilers. The home team was coming off its first win, a 3-2 overtime victory over San Jose on Thursday after opening the season with three losses under its new coach, David Quinn. Lundqvist made 25 saves, and the Rangers’ defense was steady for the most part. But timely scoring has been a problem area as the Rangers has started the season with four losses in five games. Quinn, who made the leap from Boston University to the N.H.L. when he replaced Alain Vigneault after last season, said he was seeking a fiercer approach when his squad has the puck. The Rangers had won each of their last five games against the Oilers, dating to Dec. 15, 2015. Staal, 31, the second-most-senior player on the Rangers after Lundqvist, said he remained confident and was heartened by the team’s work ethic. PREDATORS 5, ISLANDERS 2 Filip Forsberg scored twice and Viktor Arvidsson had a goal and an assist to lead host Nashville to a victory. Calle Jarnkrok and Kyle Turris also scored for the Predators, who have won four of their first five games. Juuse Saros stopped 20 shots to beat the Islanders for the second time in eight days. Brock Nelson and Andrew Ladd scored for the Islanders, and Robin Lehner finished with 24 saves. The Predators jumped ahead with goals by Jarnkrok, Forsberg and Arvidsson in four and a half minutes late in the first period. The Islanders were outshot, 16-4, in the period. Nelson scored for the Islanders at 6:14 of the second period. From the right boards, Anders Lee sent a pass to Nelson in the slot, where he beat Saros with a low wrist shot for his 100th career goal. Ladd pulled the Islanders to 3-2 with just under eight minutes left in the period. He took a pass from Mathew Barzal in the left circle and beat Saros with a wrist shot. However, Turris made it 4-2 at 4:32 of the third on the power play, the team’s first man-advantage goal of the season. Forsberg added an empty-netter with a minute remaining.